After you complete a tradermark registration with any Intellectual Property Office, you may receive a scam letter which looks like it comes from that office and asking money transfer/check payment for your trademark application. If you don’t read it very carefully, it looks like it comes from the registration authority and it creates a strong impression that this money is needed to complete your trademark registration. Well, guess what, it does not come from the authorities, nor it is required, it is simply a fraud attempt. And it asks you to send 1537,10 Euro in large letters! Now let’s read the very tiny text at the top, shall we? Dear Addresse! We offer to include your corporate text in our private company direc­tory, as far as it is included in the Official Gazette which are edited by the United States Patent and Trademark Office (USPTO). Our offer in­cludes the placement of addresses on the basis of our own data re­cords, the completion of the related work and the carrying out of indi­vidual researches. With regard to the exact details of our service (address service, individual researches, access to databases), we refer to our general terms and conditions of trade overleaf, these forming the basis for our conclusion of business. You confirm this offer by re­mitting the following amount and in doing so, you confirm that the wor­ding of the entry entered by ourselves and rendered here is correct. The duration of the period of entry as the entitled user always amounts to one year as from the conclusion of the contract. 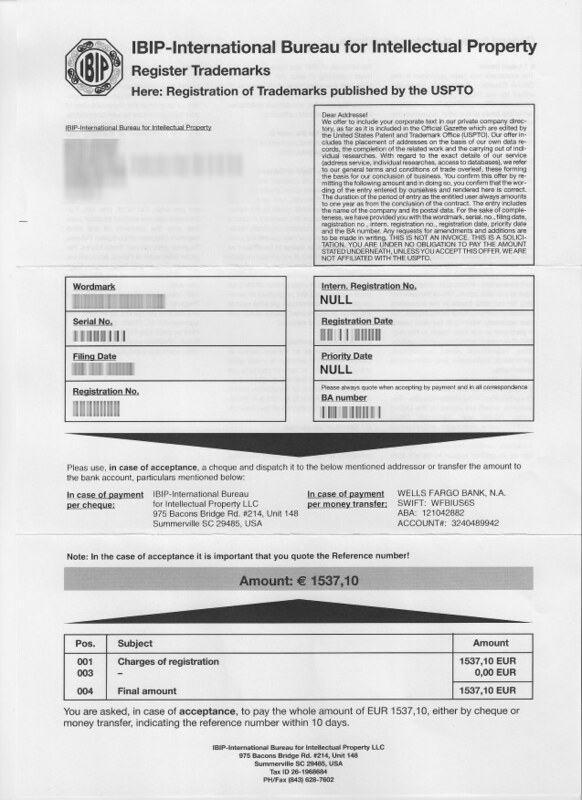 The entry includes the name of the company and its postal data. For the sake of comple­teness, we have provided you with the word mark, serial. no., filing date, registration no , intern. registration no., registration date, priority date and the BA number. Any requests for amendments and additions are to be made in writing. THIS IS NOT AN INVOICE. THIS IS A SOLICI­TATION. YOU ARE UNDER NO OBLIGATION TO PAY THE AMOUNT STATED UNDERNEATH, UNLESS YOU ACCEPT THIS OFFER. WEARE NOT AFFILIATED WITH THE USPTO. Gazette! And I’m sure many falls for this scam as the letter is pretty fraudulent. letter it means that actually your trademark is registered already (so they got the info from publisment of official organization) and your official letter of approval is already on its way. But I bet you’ll get this scam letter before the official letter and if you don’t read well, unfortunately you can fall for it. FIPTR – Federated Institute for Patent and Trademark Registry Inc.
– International Bureau for Intellectual Property”. Copyright © 2008 Logician.org. All rights reserved.